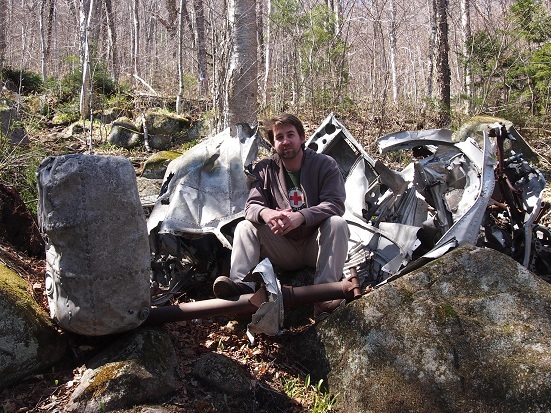 May 29, 2012 — A good hike will include majestic views of nature, encounters with non-confrontational wildlife, and a sense of distance away from the civilized world. 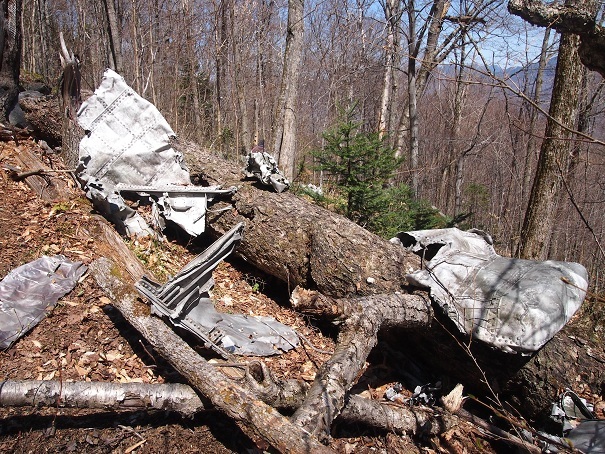 A great hike, on the other hand, will include all that plus the twisted wreckage of a 70-year old bomber crash…like at Mount Waternomee in New Hampshire. On the night of January 14, 1942, a Douglas B-18 Bolo bomber was returning to its base in the western part of Massachusetts after hunting for German U-boats in the Atlantic. 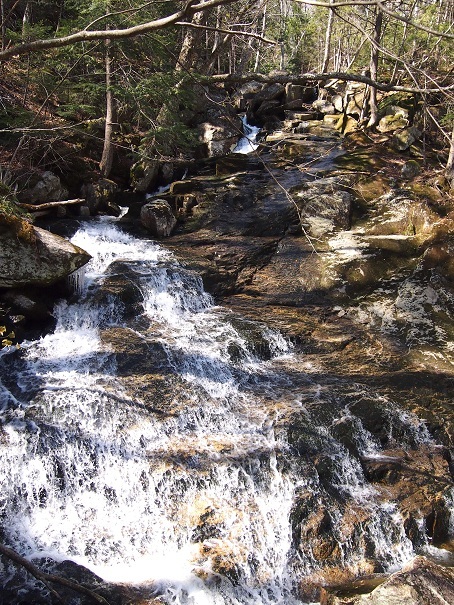 However, bad weather impaired the crew’s ability to navigate, and they found themselves in the White Mountains of New Hampshire, with the 4,000-foot Mount Waternomee suddenly pretending to be sky right in front of them. One of the pilots was able to lift the nose at the last second, but the plane still crashed into its snowy flank sometime just before 8 pm. The wings and engines of the plane were torn off, pieces of the plane scattered, and a fire broke out and ignited the fuel. Only five of the seven crewmembers were able to escape the wreckage before it blew up. Still, those five only survived their injuries and the harsh environment thanks to the tremendously difficult rescue efforts of locals who made the hours-long trek up the snowy mountain in the dark after feeling the impact of the explosion and seeing the conflagration high up on the mountain. Later, the army would strip the wreckage of anything dangerous, including detonating a 300-pound bomb that the plane had been carrying. They then left the rest of the wreckage where it lay. It just wasn’t worth the trouble of gathering all the pieces and carting it down the snow-covered mountain in a not-very-developed area of the state. 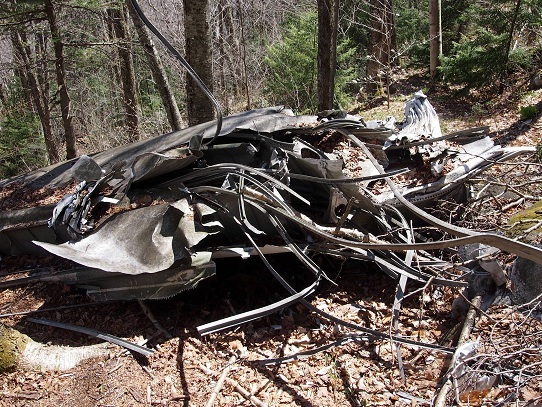 Today, the area still isn’t that developed and most of the wreckage lies exactly where it landed, strewn in thousands of pieces high up on the mountain’s south side, as unexpected as a whale fossil in the desert. It’s also completely accessible to the public if you’re willing to break a sweat. A large U.S. flag marks the site, as do a pair of plaques. The first was dedicated in 1992, and lists all seven men aboard the craft, although it doesn’t point out which two died. A more recent and less official plaque highlights the life of one of the surviving crewmembers, who became a dentist in California after the war and lived for another six and a half decades after the crash. As to the pieces themselves, they’re all over the place, of course, in chunks as small as a fist to sections as large as an automobile. Other than the wings and an engine, most of the pieces are unrecognizable to laymen, if I can be so bold as to speak for us all, I guess. A blackened, broken tree trunk in the middle still testifies to the fiery explosion. I tested a few of the larger metal pieces and found them to be unexpectedly light. 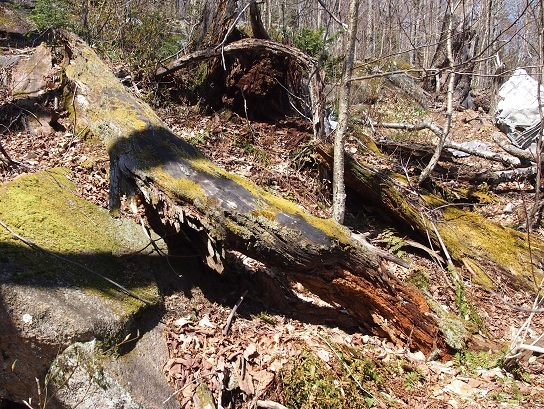 I even saw one large piece that was wedged between two moss-covered boulders actually blowing in the wind. Of course, I know nothing about aeronautical engineering, so if they’d have been heavy, I’d of observed how unexpectedly heavy the pieces were. Speaking of moss-covered, though, the wreckage itself is surprisingly clear of any kind of plant life. 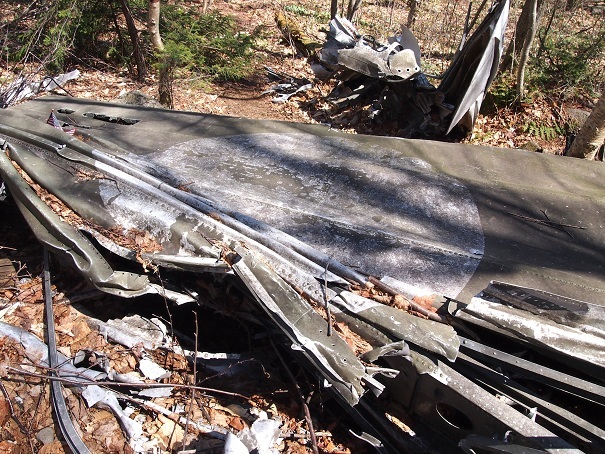 Not a single piece of metal was at all overgrown, despite the decades it had lain there. I’m assuming it’s because the landscape is buried under feet of snow for most of the year at an elevation that not’s the most conducive to nature’s usual abhorrence of vacuums. Or it has a great cleaning lady with an awesome vacuum. I can’t say the site is difficult to get to because, well, I got to it, but it definitely isn’t overly easy. It’s about 4.5 miles round-trip, about a quarter of which is up the incline of the mountain. 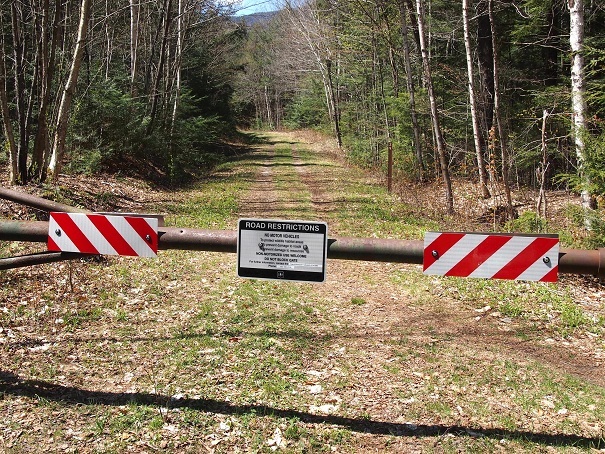 The trailhead is located at Walker Brook Road, off Route 118/Sawyer Highway, in Woodstock. It’s less a road, than it is an off-road, and only the first few score of feet are accessible by car. At that point a gate bars entry to only those on foot or in General Lees. You can park there, though, and then walk the first easy mile of the 2.25 you have to cover to arrive at the wreck. That part of the hike is basically a level, grass-covered access road, which crosses a bridge and then dead-ends at a clearing a bit later. Once you hit the clearing, the path you want is on your right, at about one o’clock as the time flies. When we visited, it was helpfully marked by an orange strip of surveyor’s tape. In fact, most of the path is relatively well-marked by orange arrows painted onto the trees. The path will take you right to a river, which you should follow upstream for less than a third of a mile, keeping your eyes open for the best spot to cross. Plenty of treacherous stepping stones span it, as do a few fallen trees. A foot-tall cairn of stones on the far bank shows where the path continues. 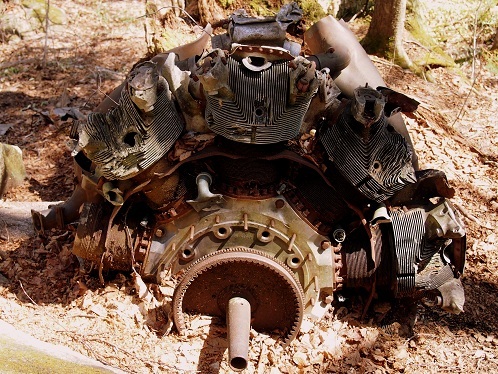 Here, you’ll be at about the halfway mark, and it’s also here that the trail starts an uphill climb that doesn’t end until you hit the bomber’s gleaming metal corpse. At one point, you’ll pass a large waterfall on your right, which is way worth clambering down to see, but I’d save it for the return trip, as you’ll need all your energy for the rest of the trek. All told, you’ll be ascending some 1400 feet of elevation, and you’re doing most of that in this second half. But all the shin splints and Lyme disease are totally worth it. 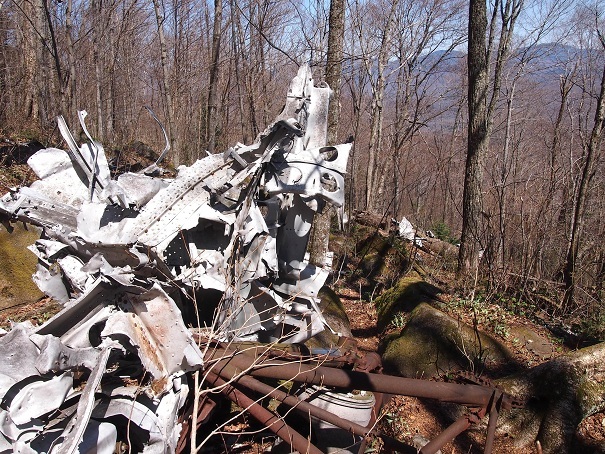 We were the only ones there and, as we sat amid the wreckage, chewing on trail mix, it felt more like we’d stumbled onto the heretofore undiscovered wreckage of some plane that had mysteriously disappeared, as opposed to one that was well documented. In addition, it gave me this strange feeling that the world was more real than I usually give it credit for. An embarrassingly large percentage of my experience is gleaned through the glass windows of the Internet and television, making everything seem merely enacted for my pleasure and interest. But stuff really happens. I know that seems like a dumb moral to leave you with, but it’s a reminder I need constantly. I mean, by the time I get to sites where tragedy and history have happened, they’re mostly all clean bronze memorials and glass-covered exhibits that might as well be TV screens. To see and touch and, in one case, trip over actual wreckage in the actual spot where it actually happened 70 year ago makes everything I’ve ever heard about in this world that much more real. 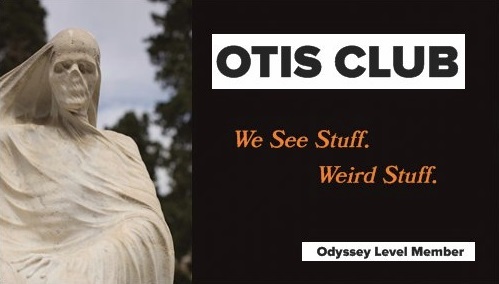 Stuff happens, man. Stuff happens. And then you have to hike back down a mountain. I suggest a sturdy walking stick. 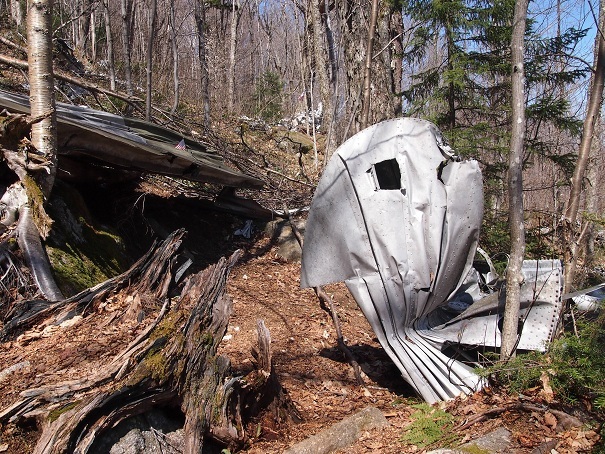 For a similar site with much easier access, check out my visit to a Cold War-era bomber crash site on Mount Elephant in Maine.